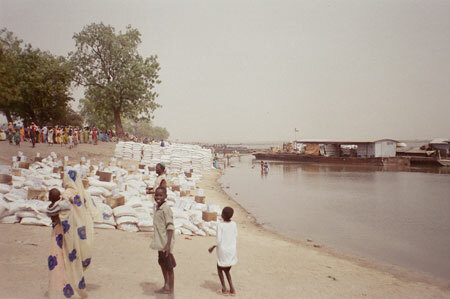 Barge and food supplied by the World Food Programme on the shoreline. These supplies have already been allocated to families since they are arranged into discrete piles with tins of cooking oil. Morton, Chris. "WFP supplies at Melut" Southern Sudan Project (in development). 03 Jan. 2006. Pitt Rivers Museum. <http://southernsudan.prm.ox.ac.uk/details/2007.137.40/>.